I first met Shasta in 2016. I was on one of my solo adventures which unbeknown to me at the time was what I now call a #Soultriproadtrip; an opportunity to ride the wings of Spirit and flow like water through the crevices of my own mind, body, and soul. A friend had told me that Mount Shasta was a Vortex, a strong energy center. I have been attracted to vortexes like Bali, Indonesia, Sedona (even though I have yet to go), and Encinitas. Mount Shasta is not just any vortex though, it's considered to be the root chakra of our planet. Chakras are energy centers in our subtle body. We have many chakras, but in the west we mostly focus on seven that run along the spine from the base to the crown. The root chakra is at the base of the spine and has to do with security, grounding, physicality, finances, foundations, and basic needs of survival. Over this past few years this chakra for me has been getting a makeover or an upgrade you might say. While I am always a student I am transitioning into more of a teaching role. Through experience (particularly experiences gained on solo adventures and quests) I have accumulated a wealth of information to share with the world. What I am learning is that it takes a lot of courage to bridge the gap between our deep desires that exist submerged like an iceberg in our subtle bodies and the intellect. Once you begin to face all parts of yourself it takes even more courage to walk the bridge of the heart and let the truth from your deepest Self be voiced. You must quiet the mind and let go of all the things you "think you should be saying" and just say what what wells up to the surface from a spring that exists deep in your soul. The message is like a flowing river. It takes turns, gets diverted, sometimes gets lodged and goes stagnant, it hits rocks and bumps along the way, but eventually it flows back to it's Source. It's nature is circulation and movement and it seems to always find its way back home. For some reason the message seems to become more clear at high altitudes. Clarity comes step by step upwards. It's as if I am trekking upwards physically to retrieve a message in the sky and bring it back down to level ground. 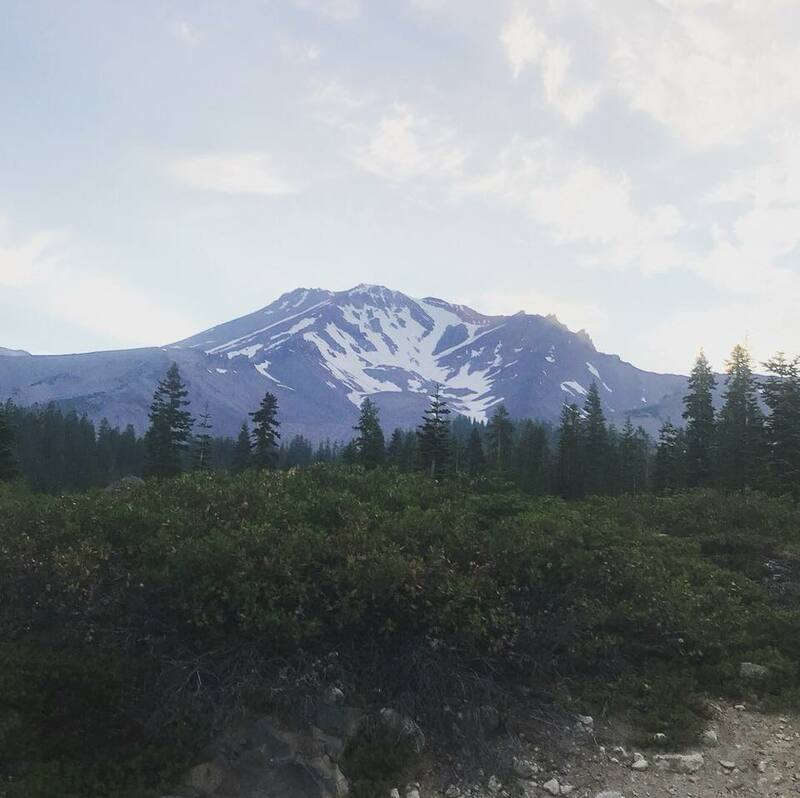 While trekking up Mount Shasta last month I could feel my enthusiasm, vigor, and tenacity build like a powerful wave with each and every step. I would tell my friend Kevin, "wow, the peak is right there! We are not that far!" We laughed as we made motivational videos on Instagram yelling into the phone, "We are limitless! No limits, baby!" It was good team morale, because we were the ones who needed the motivation more than anyone else as the trek began getting steeper. There were times I was climbing on all fours and rocks were sliding out from beneath me. I laughed and thought how it was a much more fun workout than the versa climber! Gravel and dust filled my shoes making it feel as though I had weights on my feet, but I wasn't going to stop until I reached the top. We jumped between snow patches and rocks as we gained altitude and finally made it to a camp for a short rest break. We were less than a mile from the peak when the trail disappeared. I began to feel fear creep in even though I didn't want to admit it, not even to myself. I feared not doing what I had come there to do. Without a clear path to move forward to the summit we started climbing the section that seemed the most reasonable. It felt more like rock climbing at that point than trekking. I was on all 4's trying to reach for rock to grasped and pull myself up, but the problem was all the rocks were moving underneath of me. I kept my core tight and tried to be as light as possible to move gracefully over shifting earth, but rocks from above were beginning to slide. At that time of year with not much snow the danger is rock slides and just as I thought about this, a big rock the size of my torso came tumbling down from above about 200 feet to our left. I looked at my friend Kevin and said, "I'm calling it. This isn't safe." When we got back down to the base camp I dropped to a low squat and bursted into tears. I realized that my thought process was that if I could summit this mountain I could find stability within myself. I could find a sense of permanence and control; safety and security with all aspects of myself. "The mountains I want to summit are not outside of me, they are within me! I said in between sniffles. It was clear to me that sometimes I feel the need to do big amazing and sometimes even dangerous feats to prove to myself that I have the courage, the capacity, drive, and ability to achieve greater heights, but really those feats are not always outside of me. The greatest feat would be to master my own mind. Sometimes I live for the rush, but on the other end of spectrum am I okay when things are calm and steady, or more so can I handle uncertainty? Can I handle it when I don't know if I'm going to reach the top and be okay with just being on a journey and accept whatever happens? Can I shift my perspective and not see not reaching the summit in a day as a failure, but rather a great achievement to even try and get as far as we did. Can I learn from the experience and be more prepared to try again? Or do I just cry on the mountain because I didn't get what I wanted and what I came to do? Well, it took a few miles downhill, but by the time we got back to the trailhead where I took off my shoes and drank from a mountain spring my emotional peak and crash had subsided. The upturned sand had returned to the bottom of the ocean floor and I was able to see clearly once again. In Sanskrit the word Shasta means "teacher." Every time I visit her I realize she lives up to her name more and more as she offers me many lessons- some endearing and others tough to swallow. 1. Even though something may look firm, stable, unshakeable (like a mountain) even that mountain is made of of millions of moving pieces of earth that come together and fall apart. All the little pieces of earth can pull together to support you or crumble beneath you. You are not always in control of what happens. Conditions must be right to have the proper footing. 2. You fail, you learn, you adjust, and try again. 3. Preparation is key. We didn't talk to rangers, we didn't have the appropriate gear. I thought having my food and a mobile strong body would be enough. That's a strong foundation and the first step, but certain journeys and excursions require certain tools and techniques that must be learned and practiced. It's not always a run and just go for it sort of thing. 4. The way up is usually more fun than the way down. The whole way up you're thinking how great it's going to be to reach the top. You have a single goal, a single destination. The journey is enlivening. The way down can sometimes feel like wa-waaaa. Okay, well that's over, what's next. I am working to embrace ups and downs and be fully present for them both for this doesn't just relate to trekking, but to life and the ups and downs of my emotions. 5. Respect mother nature. There are certain doors she keeps closed for good reason. You may not be ready to enter. It may be best you don't. When the timing is right the doors will swing open before you, but until then respect her boundaries. You may feel limitless in your mind, but in this tangible world there are limits and laws of nature. The journey is to learn to work with nature not to conquer it.